The James Clerk Maxwell Telescope (JCMT) is the world’s largest single-dish telescope working at submillimetre wavelengths, and therefore provides a unique viewpoint of the Universe. The JCMT with its bespoke instrumentation has contributed widely to submillimetre astronomy since first light in 1987. Aspects of cosmology and solar system studies, of star-formation and galaxy evolution are all amenable to study with JCMT. For an excellent summary of JCMT progress, read “Celebrating 30 years of science at the James Clerk Maxwell Telescope“. Below on this page is an outline of some broad scientific highlights. Papers published using JCMT observations are available by year here, and some of the most notable publications are listed here. JCMT data can be accessed directly at our science archive. We encourage all astronomers making use of JCMT data to ensure correct acknowledgements in publications. The JCMT has a strong history of science undertaken by both large and small collaborations. The JCMT continues in this fashion today under the leadership of the East Asian Observatory. Currently 50% of the available science time at the JCMT is spent on Large Programs. The other 50% of the available science time at the JCMT is spent on PI science. Astronomers who are interested in the Large Programs and/or PI science time at the JCMT should check the eligibility/funding partners page. Equipped with SCUBA-2, the JCMT is the pre-eminent ground-based submillimetre survey instrument, roughly two orders of magnitude faster for wide-field mapping than any other operational camera/telescope combination. The SCUBA-2 Cosmology Legacy Survey is exploiting this capability to undertake a survey of 5–10 square degrees of sky to mJy flux limits with the goal of detecting the thousands of high-redshift starbursts and active galactic nuclei needed to understand the significance of the dust-obscured phase in the growth of galaxies and super-massive black holes. This survey, and more ambitious studies which may be developed by a new operator, will provide unique insights into the earliest phases of galaxy formation and evolution (e.g. Geach et al., 2013). The JCMT plays a leading role in tracing the distribution and physical properties of the molecular gas and dust in nearby galaxies. JCMT data provided the first evidence of excess 850-μm continuum emission in low-metallicity environments (Galliano et al., 2003, 2005), whose physical origin remains under active investigation. Multi-frequency spectral line data from the JCMT have been essential for investigating the density and temperature of the molecular gas and their variations with environment (e.g., Israel, 2009). 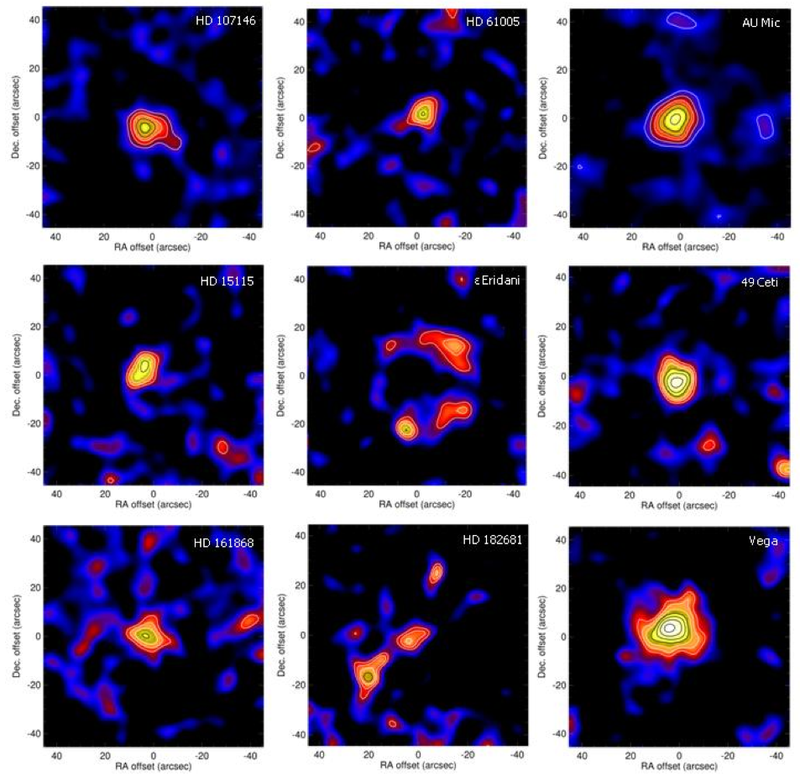 More recently, the JCMT Nearby Galaxies Legacy Survey (NGLS) is the largest survey (155 galaxies) of molecular gas with sub-kiloparsec resolution (Wilson et al ., 2009, 2012). The NGLS is also observing many of these same galaxies in dust continuum emission with SCUBA-2, providing images of the cool dust emission with unprecedented sensitivity and resolution. 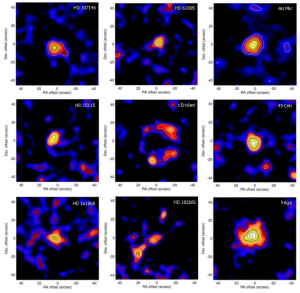 The JCMT’s high spatial resolution is critical for comparing the content of the interstellar medium with star formation properties: it is possible to distinguish between arm and inter-arm regions while providing resolved measures of the gas-to- dust mass ratio and a recalibration of the CO-to-H 2 conversion factor in galaxies. These properties are essential to building a complete understanding of the links between star formation and the dense interstellar medium in present-day galaxies. Left-hand panel: The red colours in this image show the galaxy M66 as it appears at the sub-mm wavelength of 850 microns, while the white background shows the galaxy as it appears in visible light. Regions of cold dust that appear as dark streaks in the white image glow brightly in the red image. Right-hand panel: The SCUBA-2 image at 850 microns seen on its own. Credit: VLT/ESO, JAC, G. Bendo. Deep within dark molecular clouds, the next generation of young stars is forming out of cold dense gas and dust. Submillimetre continuum emission from cold dust can trace compact structures associated with the very youngest stars, revealing the number and arrangement of such objects within a cloud. The JCMT pioneered such work with SCUBA, the first submillimetre continuum camera, revealing the youngest known protostars and pre-stellar cores. With SCUBA-2, entire populations of protostars within a single cloud can be imaged rapidly. The Gould Belt Survey (Ward-Thompson et al. , 2007) uses SCUBA-2 to map the high-column-density areas of nearby clouds to determine the character of the pre-stellar and protostellar populations and the relationships between these populations and their parent molecular clouds. Not all clouds in the Gould Belt will be imaged within the available time and there is therefore an outstanding opportunity for a new operator of the JCMT to build on and extend this work beyond 2014. Figure 3 shows one image from this survey, a 1.2°-long image of the Integral Shaped Filament (ISF) in the Orion Molecular Cloud at 850μm. The very high sensitivity of SCUBA-2 has enabled the individual protostars in Orion to be easily detected as compact bright objects. Also seen clearly here are the numerous intertwined sub-filaments in the ISF, with a large population of protostars and pre-stellar cores. The latest theories based on data from Herschel hypothesise that pre-stellar cores form mostly along filaments such as the ISF (André et al., 2010; Molinari et al., 2010). SCUBA-2 is highly sensitive to both cores and filaments, working at longer wavelengths and with superior resolution to Herschel. Its 850- and 450-μm data can probe the temperature and opacity characteristics of the emitting dust, thereby enabling very accurate probes of the masses of these star-forming objects. 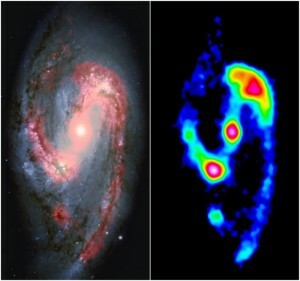 Sources found in SCUBA-2 images such as this make ideal targets for follow-up with ALMA. 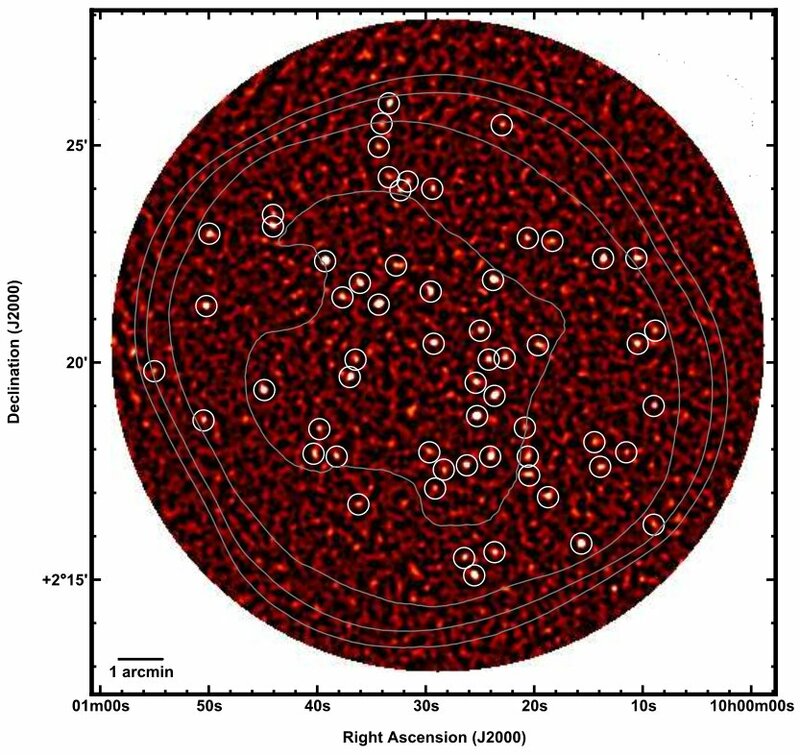 The Galactic plane as observed by the JCMT Legacy Survey teams (image credit: Jenny Hatchell with CO data from “The Milky Way in Molecular Clouds: A New Complete CO Survey”, Dame, Hartmann, & Thaddeus 2001). Debris discs are made of the ‘fallout’ from collisions among planetesimals, and if viewed externally, the Sun’s Kuiper Belt today would show a very faint, quiescent example of this phenomenon. Other nearby main-sequence stars, however, show spectacular bright dusty belts, indicating very diverse evolutionary paths of otherwise similar stars. Early confirmation that such active belts exist around mature stars was made with optical coronagraphs, but the pioneering SCUBA camera on JCMT made the first image gallery across wide-ranging spectral types, and confirmed that the dusty debris constitutes the tiniest component (of sub-lunar mass) known in extrasolar planetary systems (Holland et al., 1998; Wyatt, 2008). The parent body populations can be much more substantial than in today’s Solar System, and unexpected results include an association of such planetesimals with low-mass planets, and sometimes survival of the colliders to ages much greater than that of the Sun. This places debris disc research centrally in the picture of how planets form, evolve and become habitable — if this is indeed possible in cases suggesting prolonged heavy bombardment. The nearby disc system of Epsilon Eridani is classic analogue of a youthful solar system, with dust in the vicinity of the planets brightening into a surrounding ring, within which are seen clumps that were interpreted as gravitational resonances with a Neptune-like planet. An ongoing campaign with SCUBA-2 has confirmed clumps as co-moving with the star and will soon give a measure of their orbital rotation, and thus a hoped-for first detection of an ‘ice giant’ planet by this new technique.